When MacKay de Bar breaks the evil witch Hecuba’s mirror, a shard is left in his chest. Left on an island with Queen Eira Koldsdottir, the dark magic in MacKay makes good look bad and bad look good. 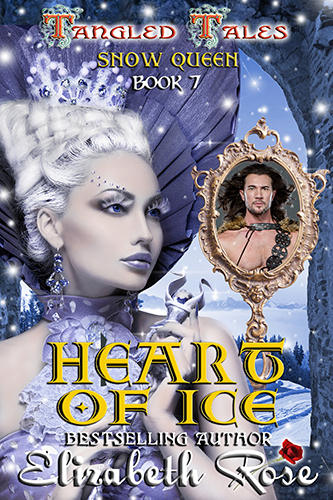 Can a man who sees life opposite, melt the snow queen’s heart before dark magic takes his life? Eira watched in amazement as the two fools tried to take on an entire room full of fighting men. They were warriors in the true sense of the word and she liked this. Slowly getting to her feet, she watched as the intruders held their own. Her attention could not be torn away from the man named MacKay. She had never seen anyone so quick on his feet and with such fast fighting moves. Aye, these men would be a good addition to her army. “Stop!” she cried. Immediately, her men pulled back, leaving the two strangers standing alone in the center of the room. They still held their swords at the ready. “Shall I take them to the dungeon now, my lady?” asked Angus. “Not yet.” Eira made her way down from the dais, her eyes fastened to the two men. She made a straight line toward them. “Stay back, my lady, they are armed,” warned Angus. “You will address me as your queen,” she retorted. “You are my prisoner now and will serve me,” she said. “I will not,” he boldly stated. Eira reached out and knocked the sword from his hand. In a second she had him in a headlock. His squire raised his sword, but MacKay stopped him. “Take them to the dungeon,” spat Eira, pushing MacKay toward Angus. Her men surrounded the prisoners and led them away. As they left the great hall, MacKay looked back over his shoulder at her, his eyes interlocking with hers. Eira wasn’t sure why, but a surge of emotions ran through her. This man interested her like no other. His fighting skills impressed her but his words to his squire saying they wouldn’t hurt women made her feel confused. Her own army consisted of both males and females. They were treated the same way. When her father and brothers were alive they always thought of her as one of the men. She was queen, but she dressed in breeches and a tunic with a weapon belt like a man. Eira had trained her men to show no favor to anyone, not even women. And they hadn’t. But something about the man named MacKay not wanting to hurt her made her feel something she hadn’t felt since her mother was alive when she was just a child. Respect for women. Still, he didn’t respect her as a queen.